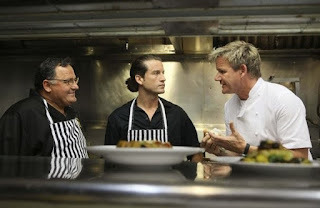 In this Kitchen Nightmares episode, Chef Gordon Ramsay visits The Greek at the Harbor, Ventura, California, where owner Makis and his wife have been running the restaurant since 1994. Makis is tired and the standards have dropped, son Aris wants to get more hands on but his father won't let him. Gordon sits them down to talk about the restaurant and discovered they haven't made any money in years. Gordon orders calamari, sampler platters and moussaka, he says the food is "dreadful" and an embarrassment to Greece. The chefs just say they are doing what they are told. Ramsay does a kitchen inspection and discovers everything is pre-cooked and reheated. The food goes out quick but customers send it back. The source of the tension between father and son is discovered by Ramsay, at his graduation party Ari said that he did not want to work in a restaurant and wanted to make something of himself, this insulted Makis. The air is cleared and Aris becomes more involved. They cook a dish together with Makis teaching Aris the dish and Gordon likes it. The restaurant receives a makeover, removing the disco balls and the menu is also revamped. On relaunch night, Aris is in charge, it gets off to a shaky start with substandard food getting through to the customers but he pulls it off for a successful relaunch. Gordon is impressed with the way he quickly stepped into the role and importantly, the customers love the food. Aris continued to lead the kitchen and is determined to keep up the high standards, the restaurant is packed and Makis is considering retiring! The restaurant is still open and their Facebook page shows regular specials and new menu items. Yelp reviews and Trip Advisor reviews are mostly positive with the occasional negative review. Planning a visit? Check out their website for opening hours and more information. The Greek at the Harbor was aired on November 18 2011, the episode was filmed in August 2011 and is Kitchen Nightmares season 5 episode 7. So glad to see this one still open! I am a pinball person, so I go around looking for locations with interesting pinball machines. My searches, one day, took me to Ventura Beach Carousel, which has a few rare and valuable machines for public play. (They are in terrible condition, but that's besides the point.) When I stopped by, I saw Greek at the Harbor right next door and thought that the name sounded familiar. My first guess was Kitchen Nightmares, but I wasn't 100% sure of that so I didn't eat there. I later found out that my hunch was right, so the next time I find myself there, I'll give Greek at the Harbor a visit. Not sure what to get though. Greek food is rather impenetrable to me; I have no idea what I'd like. so... basically you just needed to say something about nothing? your review was pointless. I'm glad these guys are still in business. The son seemed to be serious about joining the family business so it's great to see that he is sticking to it and the business is benefiting as a result.